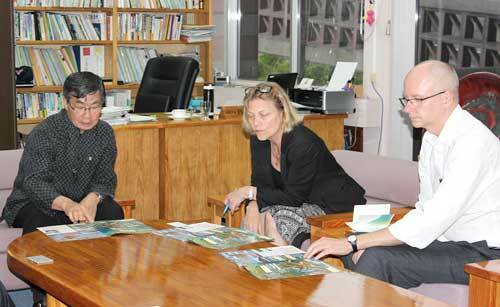 Officers of the Nordic Embassies received a briefing on the Henoko relocation issue from Nago Mayor Susumu Inamine (left), on April 10, at Nago municipal office. Diplomats from the embassies of four Nordic countries met with Mayor Susumu Inamine on April 10 to receive a briefing on the political situation, including the relocation of U.S. Marine Corps Air Station Futenma to Henoko in Nago. They heard about the mayor’s policy and how the Henoko issue is affecting the community. The four diplomats are counsellors and first secretaries at the embassies of Sweden, Denmark, Finland and Norway. Mayor Inamine asked the diplomats to visit Henoko so they could convey the current situation in Okinawa to the wider world.